Craving a taste of the Big Easy? Then stop by Daiquiri Depot to get your frozen drink fix! 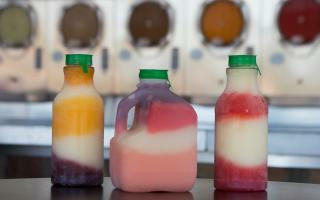 We're Arlington's premiere daiquiri to-go spot. Enjoy the classic flavors like Hurricane, Octane or Pina Colada. Or try one of our signature drinks like The Boom. Hungry? We've got you covered from pizzas, nachos, burgers and much more. Whether you're dining in and watching the big game on one of our 10 flat screen tv's or just grabbing a quick frozen drink to-go we'd love to see ya.